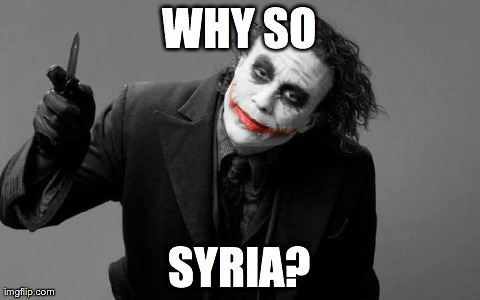 This entry was posted in Uncategorized and tagged joker, Syria on July 29, 2018 by Tom Beaty. This entry was posted in Uncategorized and tagged Donald Trump, Michael Skolnik, Obama, strike, Syria on October 9, 2017 by Tom Beaty. Brown said he favored continuing to admit Syrian refugees but wanted the federal government to hand over information that would allow states to keep track of them, the GOP state official said. McDonough responded to Brown that there was currently no process in place to give states such information and the administration saw no reason to change the status quo. The non-governmental organizations that help resettle the refugees would have such information. Brown countered by noting that state law enforcement agencies have active investigations into suspected radicals and that information about incoming Syrian refugees could help maintain their awareness about potential radicalization. He suggested the U.S. had to adjust the way it operates in light of the Paris attacks. Why wouldn’t the White House share this information? Earlier in day yesterday, Brown emailed a statement to reporters saying he’d work closely with President Obama on vetting the refugees. This entry was posted in Uncategorized and tagged Gov. Brown, refugees, Syria on September 9, 2016 by Tom Beaty.